A jobs fair in Selby is being organised by local MP Nigel Adams, with the goal of securing employment for around 100 local job seekers. The fair will take place on 4 October at Selby College. As stands are still available, the MP is encouraging other employers in the region to take part. Last year’s fair was a huge success, attracting over 1,000 visitors. Mr Adams stated that the jobs fair was a simple and effective way of businesses to find local staff. It also makes what can be quite a daunting process for job seekers – knowing who is hiring, writing a good CV and performing at interview – easier by helping people with these activities. Experts will be available at the fair to support job seekers with job hunting, making them more confident in applying for and securing a job. Some of the largest employers in the Selby area will be attending, with the expectation of recruiting around 100 staff, but Mr Adams emphasised that small businesses who only need to recruit one person would also benefit greatly from taking a stand. 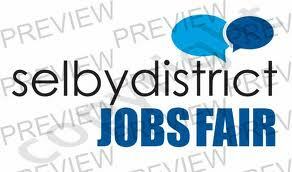 Click here to view all other job fairs across the UK! Share this news with other via clicking on the buttons below.